One of the most independent and critical columns in the Chronicle Newspaper— Hinds’ Sight— has been dropped as a result of a new editorial direction being taken by the media house. This decision was recently communicated to the Hind’s Sight author, WPA Executive Member Dr. David Hinds by the Editor of the Chronicle, Nigel Williams. In a statement to the press, Dr. Hinds said that the weekly column was not published over the last two weeks. He said that the Editor informed him on the first occasion that it was submitted too late. When it was not carried the following week, Dr. Hinds said that he asked the Editor for an explanation and he responded with a letter as quoted above. The political commentator added, “They should also say whether their decision was sanctioned by the Board. And the Board has to say what role, if any, it played in the decision. Did the Editor act based on directives from the Board, political overlords or on his own behalf? The WPA Executive Member said that it has always been an uncomfortable relationship with the newspaper, largely because he is not a “yes-man”; he is independent. 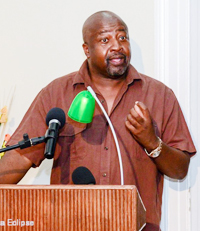 He recalled that two years ago the Sunday Editor refused to publish the column that took offence to the president’s summary dismissal of the report and findings of the Walter Rodney Commission of Inquiry (COI). Dr. Hinds commented that apparently, the Editor felt that he was disrespectful of the president. The political commentator noted that a State-owned newspaper is not a government-owned paper—the government manages the paper on behalf of the State. Hence, all stakeholders should have equal coverage and be subjected to the same scrutiny, the commentator said. Unfortunately, Dr. Hinds said that this is not the case. He stated that news-stories on the PPP are often presented with editorial bias. The WPA Executive Member said that it amounts to a mockery of democracy and true independence. He said that the PPP did it and there was strong objection so that this government does not do it, encourage it or tolerate it.